The only clue to her about-face, at around age thirty, a time when she had a successful professional life and much to look forward to, was a bout of diphtheria… perhaps it forced to face her mortality, or brought back thoughts of the college girl she had been, who had predicted her future would be “somewhere on a western farm.” By then her parents had retired to Ponca City, Oklahoma. Caroline found a job as a schoolteacher in the tiny town of Eva, staking a 160-acre homestead claim just across the road from the school, where she would live most of the rest of her life. The nearest big towns were Guymon and Boise City. There was a railroad line, and a federal highway cut through the panhandle. Maybe she liked the challenge of living in a place called No Man’s Land. But as the offspring of successful and prosperous farmers, she could not have anticipated the hardships she would discover and endure there. 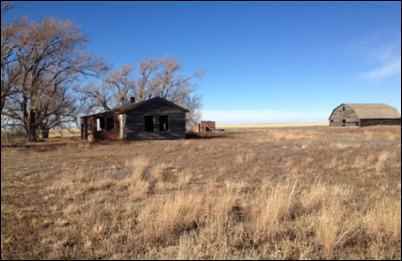 Short, painless history lesson: No Man’s Land (now identified as the Oklahoma Panhandle) was so called because since the earliest days of western settlement, no state claimed it. During the Civil War era it was designated as “neutral” territory (neither slave or free), but by 1890 there was a push for more land for Americans to homestead; this led to an initiative that made the panhandle legally belong to Oklahoma (after a brief bid to annex it to Kansas). All this was so much paper-chasing to the squatters who had already grabbed land there, but it was necessary even for them, so that they could legally own what they were already farming. As I recently watched (by the modern miracle of DVR, only two years late!) the Ken Burns PBS series, The Dust Bowl, in which Caroline Henderson’s writings formed a central part, I felt that I should celebrate Caroline’s life with a bit of my own writing. At the time, my husband Donnie and I were planning a Christmas-to-New-Year road trip out West; I insisted we pass through No Man’s Land (not for the first time, I should say), and see for ourselves the terrain and its implications, perhaps as Caroline saw it 100+ years ago, in the tail end of the official (government controlled) homesteading era. Always drawn to nature, to its special events both grand and tiny, to first causes and from there to the results that humans could affect with labor, dedication, and conviction, Caroline penned her life in a series of letters and articles that reveal youthful dreams, womanly contentment, and in the end, some scars that hard work had dug into her spirit—hard work and nearly the insuperable obstacles that were cast in her way, the unwinnable battles she fought with the natural world she so revered. By the time Caroline arrived in No Man’s Land (the name stuck for many years)—single, bold, and willing to work for wages while doing the hard work of “proving” her claim—it was ripe for homesteading, and neighbors were all around. When the schoolmarm met the cowboy, sparks flew fast, and in 1908, Carolina married Will Henderson, former drover, itinerant well-driller, tall and very thin, a man’s man. In the long history of their life together, as detailed in Caroline’s papers, it seemed there was almost nothing Will could not do—except remember their wedding anniversary or buy the right kind of ribbon when dispatched to do the shopping. Though he would leave the claim for a few days at a time to bring in cash by helping newcomers drill for water, Will could tend cattle, plow the often unyielding dirt to raise wheat and corn, build fences, maintain every kind of machinery from simple hand tools to well drilling rigs and, later, tractors and cars. To be fair, Caroline was always by his side. It was she at the other end of a pump shaft, or helping to pound in fence stakes and pull wire around their eventual 240 acres of farmland, tending the chickens and turkeys, watering the cattle, cooking the cornbread, sewing, taking care of their one child, Eleanor, and…writing. Reading and writing. Caroline’s existence as a homesteading wife was central to her sense of what people ought to be: producers, in touch with their origins and the origin of their own subsistence. But equally important was the world of her imagination and her intellect, that could not be set aside entirely, that had to be given voice. And let us give credit where it is due: veteran cowhand Will was not so macho that he could not allow his woman time and space for her need to compose and communicate. In fact, as a man who always carried a Bible, he had deep respect for her book learning. Whenever they could, the couple made time for reading to each other in the evenings. Caroline’s correspondence on their daily doings and her activities as a farmwoman comprised a series of articles that appeared in the prestigious Atlantic Monthly from about 1913 to 1937. It started out as a money-making ploy: she wrote to Ladies World magazine asking for ideas on how to make money, since they were always suggesting such schemes for their readers, and, impressed with her inquiry, they suggested she write for them, so she became their “Homestead Lady” columnist. Her writing, which extended to letters to family, friends, and once, to the U.S. Secretary of Agriculture, made Caroline a rather well known twentieth-century pioneer—and agrarian survivor. Caroline and Will, with Eleanor’s help, raised wheat and rode the boom. Her articles reflected their love of the land despite the difficulties of farming in a dry land. Her often poignant, often blunt, always organized descriptions of conditions in the panhandle would take on new significance in the desperate days of the Dust Bowl. Brief, painless history/ecology lesson: The Dust Bowl was what we might call today “the perfect storm” (in the most negative sense): a combination of (1) usual climate conditions in dry land, (2) unusual stresses including the deforestation of such few natural barriers as once existed in favor of thousands of flat acres grown in wheat, that, a result of (3) the zeal of the U.S. to produce said wheat for its own people and for the necessities of WWI, and, by extension, perhaps, (4) the determination of settlers to put into practice the long-held “Jeffersonian ideal” of the United States as a nation of farmers, capable of feeding themselves and others and, indeed, were obligated to do so. But behind Caroline’s impassioned rhetoric to friends, family, and politicians, were the horrible realities she, Will, and Eleanor experienced during the Dust Bowl years. “Wearing our shade hats, with handkerchiefs tied over our faces and vaseline in our nostrils… ‘Visibility’ approaches zero and everything is covered again with a silt-like deposit which may vary in depth from a film to actual ripples on the kitchen floor.” The dust came rolling through in giant clouds, day after day, for weeks at a time, filling everyone who saw its approach with a sick sense of dread. She once noted that “old sheets stretched over doors and windows, sprayed with kerosene” still offered little protection from the black powder. Caroline’s letters and articles during this period (most of the 1930’s) reflect a sense of dragging depression that was only conquered by the need for daily survival and an occasional small blessing: little flowers growing in the dry grass, a miraculous cooling rain. And, because she was at heart a spiritual person (who argued with the church establishment, became liberal Unitarian, and, ultimately, Universalist in her religious views), Caroline was also wise enough to put her travails in perspective, knowing the entire country was in a state of unsettled panic and privation: “During the winter we have had several letters from a young friend engaged in social work in Chicago… often I feel ashamed of my own bitterness when we read of conditions there: ‘Only oatmeal has been eaten for days… a loaf of bread must serve six children for a meal… children have gone without food until they do not feel hunger pangs any longer.’” America was down, fighting to get back on its feet. 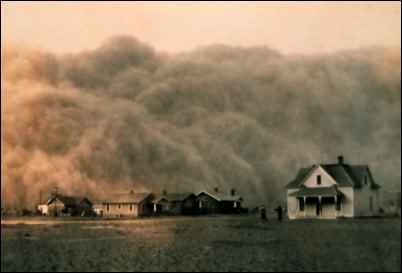 And maybe those who were foolhardy or single-minded enough to stay in the regions of the Great Plains most affected by the dust storms were the very ones who had caused the disaster in the first place. Proving—in this lengthy epistle meant to influence government and bring help to the region—that Caroline knew a thing or two about agriculture as well as her local culture, and was not afraid to speak Truth to Power… though even she was not at all sure what help would be best for the panhandle farmers, since, as she said to Wallace, “The largest amount of direct cash benefit [in the Dust Bowl region] has come through the rental checks under the wheat acreage control program… [but] such measures are contrary to the whole theory and habitual practice of agriculture.” For “rental checks” read “agricultural subsidies” that paid farmers not to farm. Caroline had a hunch that this “rental” scheme was somehow wrong, though she had not formulated her reasons beyond a strong belief in the primacy of farming and the resolve of the American farmer. Caroline stopped writing for money in 1937 but kept up her copious correspondence, written to Eleanor, to friends, even to political figures such as communist organizer Eli Jaffe. At the age of 58 she got a master’s degree. 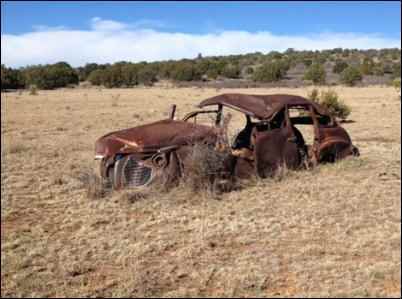 Perhaps concerned about their health and feeling unable to continue the homesteading existence—though they had toughed it out with no help well into their eighties—Caroline and Will went to live with Eleanor in New Mexico in 1963. But after three years, pining for the homestead, they returned to Oklahoma. Will died three days after they got there, and Caroline, a few months later. It was Caroline’s wish that their home and acreage be left intact, and never be farmed again. In her letter to Secretary Wallace, Caroline had written, perhaps over-idealistically, that, “I do not know of any real farmer who would not gladly produce all that his acreage and equipment and weather would permit him, if he was sure of being able to secure by his labor the means of continued production, of clean, reasonably comfortable living, of education for his children…” This expression of the Jeffersonian vision proved myopic, as industry overtook agriculture, arguably the more important gift America has to offer. In the Panhandle region, Donnie and I saw great stretches of implacably harsh scrub, utterly flat (to our foothills mindset) plains of brown dirt. Everywhere we went on our search for the Henderson homestead, we saw wrecked and abandoned homes, barns, and vehicles. I later learned that James Fallows, a modern writer for Atlantic Monthly, had passed through the Henderson’s former homesteading region not long before we, over Thanksgiving, but with more success (probably having a map!). He located their old place, now owned by a grandson who has leased it for goat grazing but not, of course, to be farmed. Fallows promises more recollections of the Henderson home and Caroline’s writings in upcoming articles that can be read online. The new story of the hard-luck panhandle, as we observed, is still written in water: the underground Ogallala Aquifer now allows those who can afford it the luxury of green fields in the desert, curiously dotting the dry desert expanses. 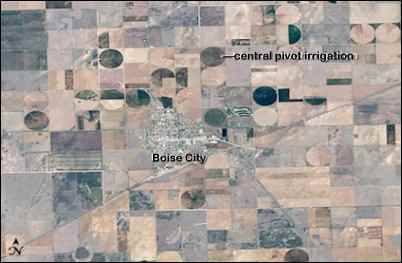 These green swathes are generally cultivated in huge circular furrows (giving “crop circle a new meaning), irrigated by center-pivot machines that have changed the outer skin of the once arid Plains. But for how long? Estimates are that the Ogallala Aquifer will be sucked dry as early as 2028, and would take 6,000 years to regenerate. And despite the aquifer and the circular irrigation that is consuming it at a rapid clip, drought is still no stranger to No Man’s Land. I feel sure that if Caroline were living in the No Man’s Land today, she would be advocating for dry-land strategies (such as growing sunflowers and other less thirsty crops) and badgering her congress-people about the shockingly rapid depletion of the Ogallala Aquifer. After all, during the “dirty thirties”, she lamented that it was disheartening for those left behind to see that “migrators” were selling off their well shafts, thus, it seemed to her, callously abandoning such precious water procurement as once had been available. Faced with the threat of the disappearing aquifer, a pioneering, pen-wielding, homesteading woman like Caroline Henderson would not have let this matter rest.